Tenjin Shopping Street (天神通り商店街) is located in Chofu, Tokyo. It is a street of "Gegege no Kitaro," one of the most famous Ghost Manga in Japan. There are the cartoon statues of the main characters of the Manga on this street. Also, some of the gift shops sale their special souvenir dedicated to Kitaro. There are 5 statues with 6 characters. The street leads to Tenjin Shrine. The characters you can see at this street. 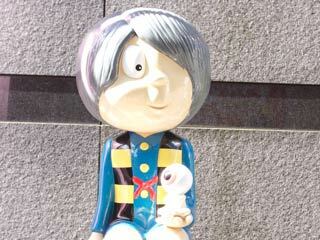 Kitaro: The hero of Manga. Medama no Oyaji: Dad of Kitaro. Nuri Kabe: Ghost of Wall.